Mick Clayton Brown ready to take on Australia’s best. Photo Ethan Smith Surfing NSW. MICK Clayton Brown is about to represent Port Stephens in the Surf Dive n’ Ski Australian Junior Titles which kick off from 1 – 8 December 2018 on Fleurieu Peninsula, in South Australia. Mick will be joined by Jordan Liackman of Caves Beach, Isaac Foran of Blacksmiths, Kayle Enfield from Port Macquarie, Madison Poole from Lambton who will represent the best from Newcastle and the Mid-north coast region when the event gets underway. Mick has been going from strength to strength, having recently taken out the Port Stephens Kaos Surf PRD Pro Cadet Cup earlier this month. He was also runner up in the Woolworths All Stars event earlier this year. He attends the Hunter Academy of Sports’ surfing program which is sponsored by Maitland and Port Stephens Toyota and trains under Coach Dan Frodsham. This program is designed to support the developmental needs of the Hunter’s young talented surfers in a high performance training environment. Regular sessions will be held at various venues primarily throughout the Hunter Region including Redhead, Merewether, Bar Beach and the Port Stephens area. Eligible athletes will be exposed to high level competitions along the key pathway events of Regional titles and State titles. This year Mick has taken out the Rip Curl GromSearch Final and the NSW Junior Title truly cementing himself as one of the best Juniors in the country who is capable of taking down the fiercest competitors. Sue Xenos Principal of Tomaree High School told News Of The Area, “We are naturally very proud of his achievements, alongside his sister Elle. “He is an positive role model in the school and despite his surfing schedule remains committed to his education. 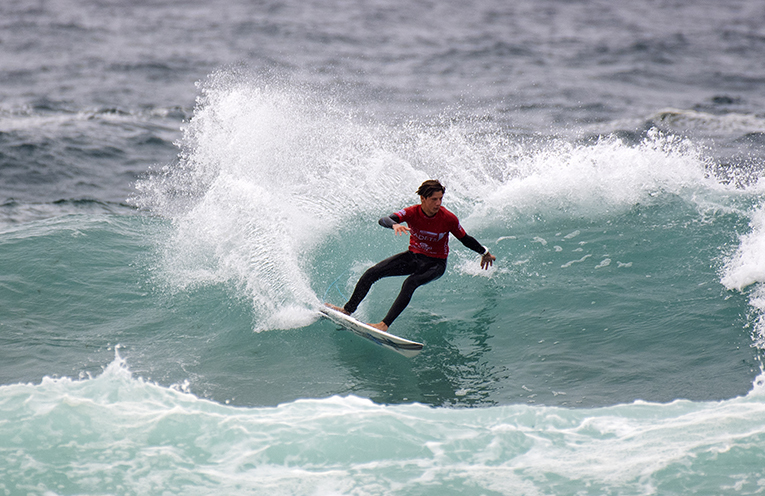 News Of The Area wish Mick Clayton Brown great success at the Surf Dive n’ Ski Australian Junior Titles.